What type of water do I need to use to grow my Triops? Please use natural spring water. The water must contain calcium. If your water does not have enough calcium your triops will not be able to molt and will die. We have had good results with Zephyrhills, Kentwood Natural Spring, Culligan Natural Spring water, Poland Spring and Deer Park. In the USA, the top selling waters (Dansani, Wal-Mart Tru-Value Brand and Aquafina) have labeling indicating the water is purified and for that reason they fail to grow Triops. You need to avoid all water labeled distilled, reverse osmosis or deionized. Read the back of the label or call the manufacturer to determine how it is purified. Do not use mineral water. Mineral waters’ like Evian have too high of a mineral content and will fail to grow Triops. Look for water labeled Natural Spring Water not just Spring Water. What type of light is required for growing Triops? You need either natural light or fluorescent light for a bright light source positioned about 12 inches from the container. Without enough bright light, your Triops will fail to hatch or die. You may also need to use an incandescent light for warmth. You still need natural or fluorescent light even if you are using an incandescent light for warmth. Your water temperature needs to be between 73°F and 85°F (23°C and 29°C). In cold weather you may need to leave an incandescent light on 24 hours a day to make sure the water temperature does not go below 73°F. If you need to leave your incandescent light on 24 hours a day, give your Triops a rest at night by loosely covering the tank with aluminum foil. How long does it take the Triops eggs to hatch? Your eggs will hatch between 24 and 96 hours after placing them into the natural spring water. How many eggs do I need to use? Use approximately 20 eggs for each hatching. Your egg dish contains enough eggs for 2-3 hatchings. You should get 1-3 Triops per hatching. How do I feed my Triops? Once your Triops hatch, you will need to feed them. Place a thin slice of crushed peeled carrot into your hatching dish as a constant supply of food and follow the feeding directions provided in your instruction sheet. Be careful and don't over feed your Triops. Overfeeding can cause high bacteria levels, which can lead to drastically lowered oxygen levels, causing your triops to die. If you hatch your Triops in your own aquarium be sure it holds one-half to one liter of water only. Triops will starve trying to find food if the tank is too large. My dish of eggs was empty. / I did not get any eggs. Triops eggs are only 1mm in diameter. Please open the egg dish over a white sheet of paper even if the dish appears empty. My Triops did not grow. What’s wrong? Read your instruction sheet and helpful hints again. Insure your night time water temperature stays above 73°F. Make sure your Triops received either natural or fluorescent light. Change the type or brand of water used and insure the water contains calcium (use natural spring water). Hatch in a small amount of water (less than 1 liter). If your Triops did not grow, change the brand of water prior to hatching additional eggs. Can I grow my Triops larger? To help your Triops grow larger, supplement their diet with pet/fish food such as brine shrimp or small pieces of fish or shrimp. I ordered the Scholastic Triops and the egg capsule was crushed. What should I do? The white powder in the egg capsule is corn starch. Your eggs are not damaged. Follow the instructions and place the corn starch containing the Triops eggs in a glass of water to separate the corn starch and eggs. 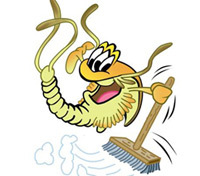 How do I use your Triops warranty? “If for any reason your eggs did not hatch and grow, send $2.00 for shipping and handling along with your address and a replacement baby food and eggs will be sent to you. All warranty replacements are shipped by our warranty group that collect requests from the PO Box listed. The $2.00 covers postage and handling. The replacement Triops eggs and baby food are free of charge. With our replacement eggs, there are enough eggs for 3-4 hatchings. If your first try does not work, then use another brand of natural spring water for the next hatching. If you have additional questions or require additional help, please e-mail us at customerservice@toyops.com. Can’t wait on e-mail? You may also reach us at 850-479-4415. COLD WEATHER NOTE: The hatching of Triops can take up to 3 to 5 days more when the weather is cooler. Therefore, Triops must have a bright, warm light during these cooler days. Please allow this extra time before inquiring about a replacement for non-hatching of your Triops eggs. I do not see any Triops eggs in my egg dish! Where are they? Most people expect the Triops eggs to be large like a fish egg, but they are very tiny! The eggs are smaller than a grain of sand. Be careful not to open your egg dish near a draft or they could blow away! Also, check the inside top of your lid in case the eggs are stuck under the lid. It is best to open the dish over a white paper so any eggs that fall from the dish are caught. Why didn't my Triops hatch? Newly hatched Triops remain tiny for the first 5 days. Feed according to the directions even if you don't see them. If after 6 days you don't see any young Triops swimming about, follow the warranty instructions in your kit. If you followed the directions carefully, try changing the brand of water you used for hatching and review your instructions for any possible errors that were made the first time around. I noticed newly hatched Triops in my tank weeks after I added my original eggs. Is it possible that one of my Triops laid eggs and they hatched? Possibly, more likely, though, it is an egg that did not hatch from your original batch. Can you tell me how to breed multiple generations of Triops from one kit? Sorry, we can't help with this. All the educational information we have is on this site or not available. Where do I apply the thermostrip that came in my Triops kit? Apply the thermostrip on the outside of your tank so you can easily read and monitor the water temperature. Place it on the opposite side of the light source so it is reading the water temperature rather than the light source temperature (radiant heat). How do I change the water and clean my tank? Use bottled drinking water even if your original directions call for distilled water. If the temperatures of the tank water and the replacement water are different, you might shock your Triops, and they could die. That’s why it’s necessary to place the new water near your tank water so that both will be the same temperature when you change the water. Once the water temperatures are the same, you can gently pour your Triops into a temporary disposable container. Then pour all the tank water into the toilet and rinse the tank with the bottled spring or drinking water. Next, add the bottled spring or drinking water to your tank, and then gently pour your Triops back into the tank. If the Triops are large, you can gently pour off 1/3 of the water directly into the toilet and replace. Repeat this step every 3-5 minutes until the tank appears clean. Your Triops will die if you shake or stir up the bottom gravel while water changing. Make sure you change the water several times or until water is crystal clear to your vision. Do not start water changes until day 8. I do not see a line on my thermostrip! This means your water temperature is either lower or higher than the temperature indicator on the strip. Try moving the tank to an area where the temperature is within the ideal temperature range of 72-84° F.
What size tank should I use for my Triops? Triops should be hatched in the tank included in your kit or in a small, shallow dish containing less than 1 liter of water (approximately ¼ gallon). They will grow larger if transferred after 8 days to a larger tank (1 gallon or more). Be sure to follow the instructions that came with your kit, as each kit comes with different components. Can I add aquarium plants and stones to my tank? We cannot guarantee that extra objects added to your tank will not have negative effects on your Triops, so we generally say do not do this. But if you insist, be sure to rinse the plants or stones in bottled spring or drinking water for 24 hours to try to remove any pollutants. Can I put my Triops in a tank with my fish? NO! 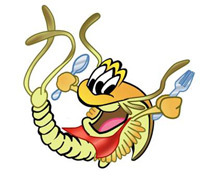 Remember that Triops are carnivores and they may eat your fish! If the fish are larger, they may eat your Triops. I lost my instructions what should I do? 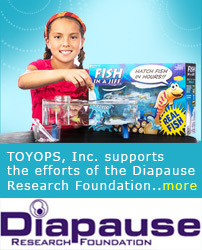 Please go to the Products section and locate your Triops kit. Here you will find the most recent version of the instructions for each kit. These can be downloaded to your computer in a PDF format. To view these files, you will need a copy of Adobe Reader. NOTE ON SCHOLASTIC PURCHASES: If you have purchased your kit from Scholastic, you must go to www. scholastic.com/undersea/ and enter your secret password (found on page 6 of your latest book). What else can I feed my Triops? Triops kits come with a well-balanced, nutritional mix of pellets. Please feed as directed in your instruction manual. If you run out of food, you can purchase any pellet fish food from a local pet store. You can also supplement the Triops diet with freeze-dried bloodworms and brine shrimp, with tiny bits of raw/cooked fish or shrimp (hold the spice!) and with peeled carrot. Hot dogs kill them so don't even think about it. My Triops keep disappearing. Could they be eating each other? Yes, Triops are cannibals and known to eat the weakest, smallest or sick. Be sure that you are feeding them often enough and supplementing their diet to try and curb this behavior. The only fail-proof way to get them to stop eating each other is to move your Triops into separate tanks or to a much larger tank on day 8. If you are missing a part or received a kit with a damaged part, please write to our Warranty Department requesting a replacement. Include a proof of purchase. If you have any questions concerning our policies, please e-mail us. What do I do if my Triops do not hatch? 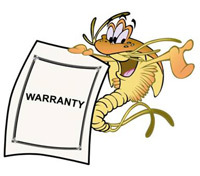 All Triops products include warranty instructions. Please note that if you do not send your Proof of Purchase or SASE, we are not able to send you warranty parts. Warranties cannot be handled over the phone or by e-mail. Please allow 2 weeks for warranty parts. What can I use as Proof of Purchase for my Triops warranty? How come my warranty parts are packaged differently than my original Triops eggs and nutrient? 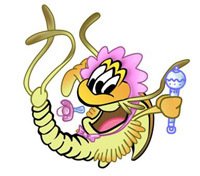 Warranty parts include a bag with Triops eggs and Triops baby food. This allows for parts to be shipped as efficiently as possible and helps keep our warranty cost at $2.00. I bought my Triops on eBay. Is my warranty still valid? If you bought your Triops on eBay, your warranty is valid only if your eBay seller purchased their stock directly from us. To find out if your seller bought directly from us, ask him or her, or request their name and/or the legal name of their business and call us to find out. Always read a seller’s feedback before bidding on eBay. On occasion, sellers on eBay have been known to tamper with kits to make extra profit. This is why we must put conditions on warranting kits bought and sold on eBay. I live overseas and purchased my Triops overseas, too. How do I submit my warranty? If you purchased your Triops from one of our overseas distributors, your Triops are warranted, but they are warranted by that distributor. The distributor’s address should be on the warranty form. Please follow their instructions to claim your warranty. What species of Triops do I have? Triops longicaudatus, originally collected from the U. S. Northwest and presently grown in a lab setting to avoid disturbing the environment and destroying an important food source to many animals, including birds. Triops is the Greek word for “three eyes”. The “third eye” is an ancient pit organ that senses light. It is located above and between the two other eyes. Sometimes it is hard to see because it is a lighter color than the other two eyes, so look hard and get out a magnifying glass! Is one Triops called a Triop? No. Triops is the scientific name of the creature. Therefore, it is always called a Triops and is always spelled with a capital T! Why do Triops have such a short life span? The average life span is 20-90 days. The Triops natural habitat is in temporary ponds. Since the ponds are temporary, the Triops have evolved a survival method of hatching and laying eggs quickly before the ponds dry up. The warmer it is, the faster they grow, and the quicker they vanish. 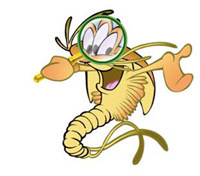 What makes your Triops products different than other Triops companies’ Triops products? Our Triassic brand Triops are the only Triops products on the market that contain lab-raised Triops eggs. We do not take Triops or their eggs from their natural habitat. This means that we give you eggs in “pure” form and guarantee that you receive the highest quality products on the market. It is the only kit where you can easily inspect your eggs. Remember they are tiny and easy to lose.